It was a beautiful thing to watch. There's nothing sweeter than witnessing a Donald Trump implosion in front of 100-million people. I suspect the first presidential debate will likely go down as the modern-day Kennedy-Nixon contest for its ultimate impact on the election. The debate could be summed up against a singular backdrop: the candidates each had one critical mission to accomplish. Trump needed to demonstrate a temperament that's presidential. Clinton needed to be likeable. That's it. Because when it comes to substance and policy, there's no contest. So what happened? Trump showed up as he always does: cocky, brash and, unfortunately for him, winging it. And to borrow from Trump and his surrogates, she came "over-prepared." 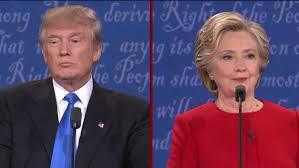 By the end of the night Trump appeared scared, ensnared and woefully unprepared...while Clinton was composed, disciplined, engaging, endearing and affable (as an aside, I don't think Team-Trump will be accusing her of "not smiling enough" anymore). And while she took the high road, he snaked along the curb. The big question leading up to Monday's debate was "which Trump will show up?" Would it be boring Trump? Toned-down Trump? Old Trump? New Trump? But it was much simpler than that. Just Trump showed up. The one and only Trump. The same smug, belittling, thin-skinned egomaniacal Trump the world has known since his rich pappy gave him that "small" $1-million loan and put him on the New York real estate map. The Trump we saw was the familiar bloviating empty-suited bully. He was loud, angry, belligerent, combative, nasty, demeaning, dismissive, disrespectful and dishonest. He sighed, sniffled repeatedly, nervously guzzled water, made juvenile mocking faces, interrupted Clinton 30 times and was disrespectful to the moderator Lester Holt. It was not pretty. Like Nixon's performanace in 1960 against the calm, cool, polished, telegenic John F. Kennedy, it was awkward and unattractive. The only thing missing was Nixon's sweaty 5 o'clock shadow and dark-circled darting eyes. I'm not going to get into the weeds of Trump's pathology except to say that his lying, narcissism, sexism and racism took center stage. He was consistently offensive when the subjects were the birther movement, black communities, Clinton's appearance and health, women and his "deserved" attacks on Rosie O'donnell. He justified his racial discrimination charges from the 1970's by saying other real estate developers had also been sued by the Justice Department. In Trump's convoluted world, every despicable act is justified if someone else has also done it...or done it first. Yes, Just Trump showed up alright, and voters got a solid glimpse of the man who insisted he has the right temperament to be president even as he made that claim while seeming totally unhinged. Trump appeared to admit that he pays zero federal income taxes ("Because I'm smart") . He seemed to admit that he could release his tax returns at any time (said he'd do it, despite his lawyers' counsel, if Clinton releases "the 33,000 emails."). One of the most bizarre moments came during the subject of cyber attacks and hacking, and whether the United States government is being targeted by Russia. He defended Russia, his praise of Vladimir Putin, and his challenge for the former Soviet Union to "find the missing emails," claiming that it could be anyone doing the hacking, including China or "someone sitting on their bed that weighs 400 pounds." Give him credit. Just when you think he can't offend any other voter group he goes ahead and loses the overweight block. "I think Donald just criticized me for preparing for this debate. And, yes, I did. You know what else I prepared for? I prepared to be president. And I think that's a good thing." The argument can be made that Trump's decision to forego the typical debate prep in and of itself is a unequivocal disqualifier. That if he doesn't think the job requires an investment in time and preparedness, then he's not fit for office. To be sure, for ninety minutes Monday night Trump drove that point home masterfully.